← What Month Is It Anyway? It’s Fall and I LOVE NUTS! I grew up quite shy and have a tiny voice. Grant, my husband, has a big voice and has never met a stranger. When we first starting dating, he delighted in exclaiming odd, random phrases to me in public. I quickly adjusted and expanded the limits of what easily embarrasses me. All for love! One of his most common phrases to exclaim in our favorite Seattle markets was, “I LOVE NUTS!” I got used to it. In fact, probably the entire grocery staff did as well. Heehee. And it is true, we do love nuts- just about every kind- raw, roasted, ground into a delicious nut butter, and tossed in recipes. They are a common snack for us. Our favorite way to enjoy them is this recipe I have posted before. 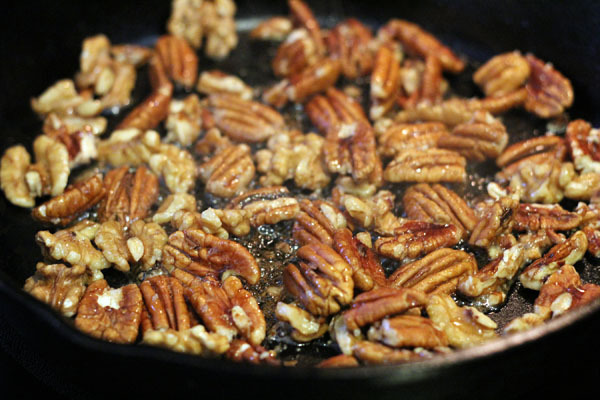 I recently found need for a sweet pecan recipe and decided to use maple syrup. I’m pretty sure this is the vegetarian equivalent to maple smoked bacon. They were delicious. We ate them on their own, used them in a Roasted Beet Salad with an aged goat cheese, chopped some and tossed them with rosemary and fried shallots to top a Pumpkin Risotto, and that was just in the first two weeks. This recipe will be around for a long while. So here it is. 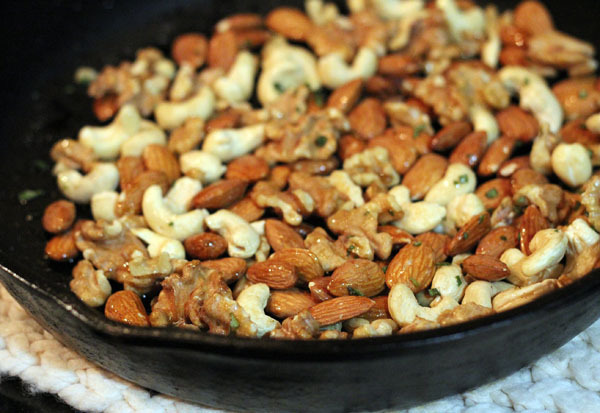 In a bowl, mix the nuts with the maple syrup. Sprinkle with salt. Place in an iron skillet over medium heat. Stir often. Get nuts nice and toasty. Be careful not to let them burn. Remove from heat and let cool in a bowl. They get a little stuck together so just break apart with your hands or a fork. Enjoy! The possibilities are endless. Maple Roasted Pecans mixed with Fried Shallots and Rosemary atop a Pumpkin Risotto! I also wanted to share this little family cobbler recipe. I was home in South Carolina this summer, visiting my Mom. She kept talking about us making a peach cobbler which we ended up not getting to but I later asked her what recipe she was thinking of. It is an old family recipe she had pulled out and been making lately. Apparently, my grandmother and great aunts up in Virginia used to make it all the time when I was little but I only have a vague memory of it. The ingredients are quite simple- 1 cup self-rising flour, 1 cup sugar, 1 cup milk, and 1 stick of melted butter. My Mom jotted them down for me on a little slip of paper. I brought it back to Tennessee with me and meant to make it for weeks. 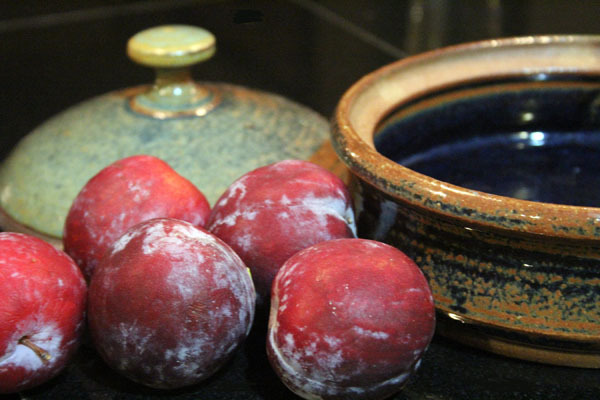 Well, the peaches went out of season and all of a sudden I found myself with a bowl full of fresh plums. I thought this would be a perfect time to try that recipe. I, of course, set out to alter the recipe and as I started cooking realized I wasn’t quite clear on the method as there were no directions so I called her in the middle of baking to get it all worked out. I later realized in talking to my friend Melissa over at Corbin in the Dell that this was almost identical to one of her cobbler recipes which she made for me on my birthday back in the summer. She bakes hers in a shallow dish which definitely seemed right, although, Grant and I agreed that we also liked this cakier version which was a result of me using a small dish. That, however, made it less cobbler-like. We kept trying to figure out what to call it. It was sort of a pudding cake or a plum right-side-up cake (because we didn’t flip it). What we knew for certain was, it was delicious. We’ll keep playing around with this one. For now, here is the recipe I came up with for the plums. Preheat oven to 350. 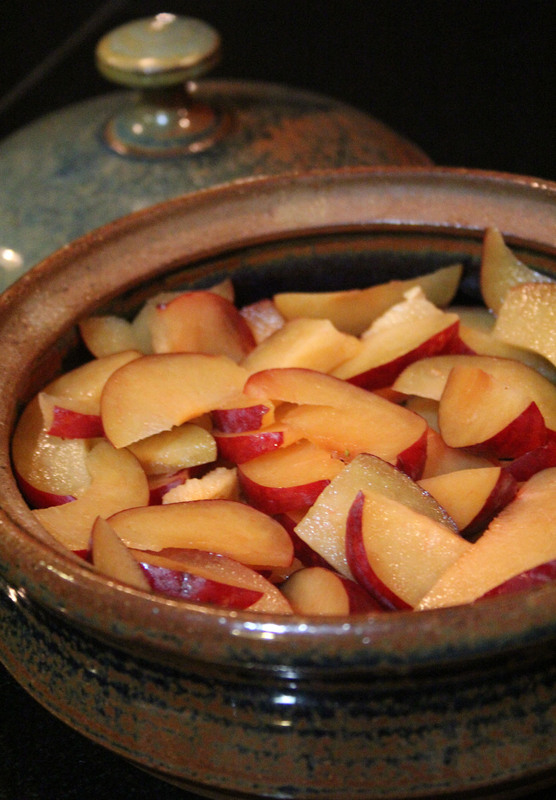 Lay the sliced plums in the bottom of a baking dish. (Mine was a round, smallish dish… Maybe 9” in diameter.) In a bowl, mix the flour with the baking powder and salt. In another bowl, mix the sugar and melted butter together. Stir in the milk, cinnamon, and vanilla. Add the flour mixture and stir well. Pour the batter over the plums and bake for 45 minutes or until the cake is cooked all the way through and brown on top. I will close with a new music suggestion. I have been enjoying a new release of Bakersfield songs that Vince Gill put out with pedal steeler, Paul Franklin. These two guys are solid Nashville players. I often wonder what will happen when the last of the older classic country musicians are all dead and gone. Vince Gill is one of the first people who comes to mind in helping to fill that void. He seems like an upstanding, all-around nice guy with loads of talent and a real respect for the older generation of country music musicians. He’s very down to earth, thoughtful, and smart. Paul Franklin is a top-notch pedal steel player. 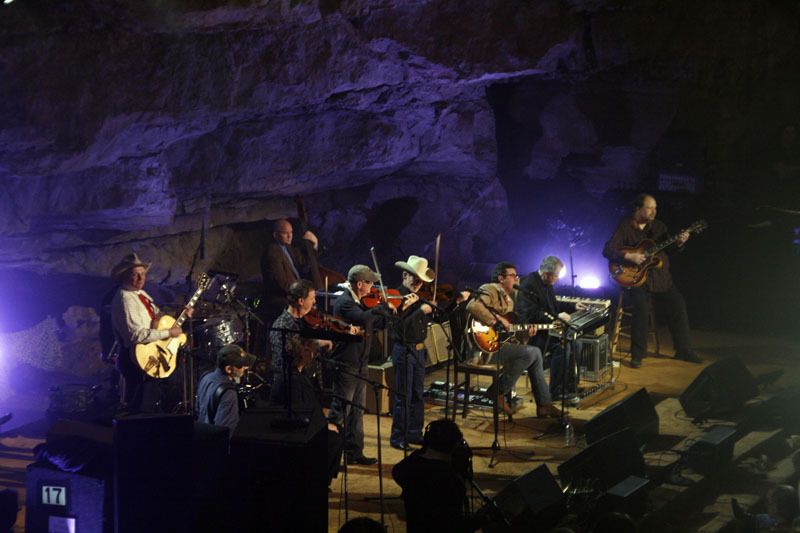 The Time Jumpers at the Cumberland Caverns for the show Bluegrass Underground. February 2012. Both of them play with the Grammy nominated super group, The Time Jumpers who play every Monday night (when they are in town) in Nashville at 3rd & Lindsley. You can buy their new album, Bakersfield, here and listen to a great interview about it on NPR, here.